As some of you may know, I spent 8 very happy years of my life as a lecturer – one respect in which I did follow in my mother’s footsteps. On my first day, I walked into a banked lecture hall of 110 students, having never lectured in my life. Up to that point I had spent my entire working life (only 2 years, mind you!) in the South African Hight Court, defending criminals – but facing down a beady-eyed High Court judge pales in comparison to facing down a room full of 18-year olds, many of them not much younger than I was at that stage! I took the approach that if I didn’t tell them I was a newbie, they would never guess – so I just launched into the year as if I had been foing this my entire life. I was serious, I wore heels and smart skirts, and I tried in all respects to behave like a responsible adult. By the time they realised that I was in my first year of lecturing, it was 6 months down the line and i had already established my authority. I often think back to that first day and how stiff and formal I was in front of the class – and then I think back to how my classes were towards the end of my eight years. We got through the syllabus allright, but in between we laughed and teased; we shared some personal stories; I wore sundresses and sandals in the summer; and when the class was unruly, I bribed them to settle down by promising a dirty joke when we got to the end of the chapter. A few years after I had stopped lecturing, I bumped into an ex student of mine. We chatted for a while about what we were up to these days before he told me that I was one of the best lecturers he had ever had. But as my chest swelled with pride, he instantly burst my bubble by saying that the one thing he will never forget about my classes was not understanding how human rights work; or how to form a contract – but “the joke about the pear”. A guy throws a fancy dress party and tells all of his friends that they must come dressed as a human emotion. On the night, his first guest shows up an dressed entirely in green.“What emotion are you?” the host asks“I’m green with envy,” replies the guest. The host smiles and ushers him in.The next guest is beautiful woman wearing only a feathery pink boa wrapped around all the luscious parts. She replies, “I’m tickled pink!” The host nods and grins, and lets her in. When the doorbell rings again, the host answers, only to find to find a naked Rastafarian guy with his p3nis poked into a pear. Forelles are bell-shaped with a distinctive pink blush. They tend to be smooth-textured and juicy with a sweet, almost spicy flavour. Williams are yellow-skinned when ripe, with a classic pear shape and sweet fragrance and taste. They keep their shape well when cooked. Packhams are roughly bell shaped but often have a slightly lumpy, uneven appearance. They are green and pleasantly crisp when almost ripe, turning beautifully juicy when ripe – and almost never turn mealy. Pears are a great snack – high in fibre; low in fat and calories; high in potassium, Vitamin C and Vitamin E; and a good source of pectin which can help to lower cholesterol. And of course, they are delicious! 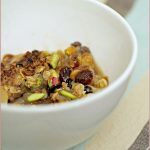 pear, apple and pistachio crisp. One of the few things I hadn’t made with pears, though, were muffins. But I had a bag of excellent Flahavan’s porridge oats, and of course my bounty of pears, and discovered a little jar of maple syrup that a colleague had given me hidden in the back of a cupboard. Voila! 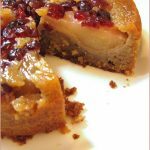 The recipe I used was a slightly modified version of this one and the end result was fabulous: moist, spicy muffins studded with chunks of sweet pear flesh. Beautiful country, beautful fruit, beautiful muffins! DISCLOSURE: I received the pears as a free sample from South African Fruit. These muffins are spicy, delicious - and surprisingly healthy! Preheat oven to 200C. Grease the muffin tin or cups with a light coating of cooking spray or butter. 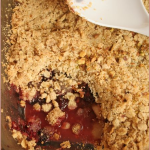 Combine the two types of flour, bicarbonate of soda, baking powder, salt, cinnamon and cloves in a bowl and set aside. Core and dice the pears into small chunks. 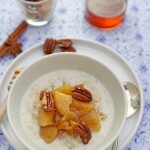 Combine the pears, buttermilk, maple syrup, oil, sugar, egg and all but 2 tablespoons of the oats together in a second bowl. Allow to rest for 5 minutes. Mix the pecans and reserved oats together to use as a topping for the muffins. Set aside. Combine the wet and dry ingredients together until just mixed. Spoon batter into muffin cups, filling each cup up to two-thirds full. Sprinkle each muffin with the with the pecan/oat mix and bake 18 to 20 minutes until a toothpick inserted in the middle comes out clean. Allow to cool for 5 minutes and remove from pan before cooling on a rack - or do as I did and serve hot with butter and strong coffee! Not sure my previous comment got through – hilarious! I can quite see why this joke was more memorable than legal stuff!! Three different varieties than the Bartlett, D’Anjou, Bosc, Asian, Flemish Beauties, and Red Clapp pears we grow here in the valley.Red Clapp, what a name..wink. I love to hear about different varieties but I love to eat and cook with them more. I don’t think any of our lecturers were quite that memorable. Most of my memories of university don’t involve any of the syllabus. I’m sure I would have remembered that joke though! Love pears in muffins and this sounds a really nice combination. Hi Jeanne. WOuld this recipe work if I use plain low fat yougert instead of the buttermilk? I hate having half a pot of buttemilk standing in my frigde so I always avoid recipes if it does not call for the use of 500ml buttermilk. Regards! Divine! Those muffins are wonderful. Spicy treats always get my vote. HAH. I bet many students were wondering about your fruit. 😉 The muffins look lush! Wow, these muffins look amazing! Thanks for the recipe. Oy that joke, I can see why that would be memorable. I wish all my teachers were that entertaining when I was in school! Love the joke, I shall attempt to remember it to tell when wine inpears (see what I did?) my judgement that it is best not told! Takes a bit to overcome the dread of the stacked classroom full of faces. You surely figured out your own way to express yourself and that besides the jokes is what makes a great lecturer. A great story and recipe. I dearly love pears, their taste and oh my goodness, their shape! Could you please post a recipe on how to make stud-muffins? Tasty, fluffed up ones? ?